Nowadays, Celina is one of the chosen licensed Bent Branderup Trainers (since 2013) and based is in northern Germany, but active all over the world teaching clinics & clases. On a typical weekday, she teaches 4 to 6 riders and trains 8 to 10 horses herself on different levels, from ground- and lunge work to Levade. On a typical Weekend, she accompanies 8 riders on their journey into the art of riding. As a hobby, Celina is still a rider and a student herself. Next to educating Youngsters, training horses and rehabilitation, four adorable horses who have picked her as their human and with whom she enjoys spending time while developing further together. Looking back, as long as I can remember, there was always just this one thing in my head - ponys! Ennerving my parents through my whole childhood , I was finally allowed to start riding in a common riding school at the age of 9. But I was well prepared - having read all the books I could find about horses, horsebackriding and everything only slightly connected to that. So I knew at least theoretically everything about horses, the sensitiv beeing it was supposed to be, and the kind way you have to behave as a rider. A living nightmare for each riding teacher, I have to confess. Than there was finally the days of my first lessons - and I was shocked. I was sure that this was about me. I had to be the least talented person in the world. There was no other explanation. But somehow, it did not become more light, even throughout the years. Though my riding skills did not improve the way I was longing for, I somehow always got attached to horses that were kind of difficult. And always sorted it out, surprising for my teachers. At a certain point, my teacher gave up to advise me to put more pressure into a horse. I preferred falling down - I just could not stand it. So finally, I was fed up, and gave up riding completly when I was around 16. I had already won some smaller competitions, so it could not only be me, I thought, and saw friends of me training for bigger competitions and did not like it at all. Some weeks later, my boyfriend really hit the core. He nearly pleeded to look for a horse to work with again - otherwise, he was afraid, that he could not stand me any longer. Going back to a riding school was out of any kind of discussion. So I found a private horse, a difficult one of course, to work with. His owner brought someone to the stable who offered classical dressage, after the usual ways of riding failed to keep this horse working. A real stroke of luck, it turned out. My new teacher brought - freshly printed - the book "Academic Art of Riding" by Bent Branderup. I got into that straight away - and never regretted or returned. I will never forget when I saw for the first time Bent working with his horses, especially his blind stallion Hugin. I barely had seen something more beautiful, peaceful and silent ever before in my life. That was still when Bent was living in Hamburg... how long ago is that? Something around 15 years? I started to use every free (or not free) minute, to get into the matter, spend a lot of time in Hamburg, was an eager student for my teacher at home and always longing for more. Nevertheless, after returning from Hamburg, 9 month later there was a free spot at Bent's place in Denmark that was unforeseen offered to me. Two weeks later my horse was on a trailer and I on my way to Denmark. I think I do not have to mention that I never could stop? I returned to Bent over and over again - 8 internships followed. A summer with Maria Roob was added, too. And I met another very inspiring and important teacher for me as well. 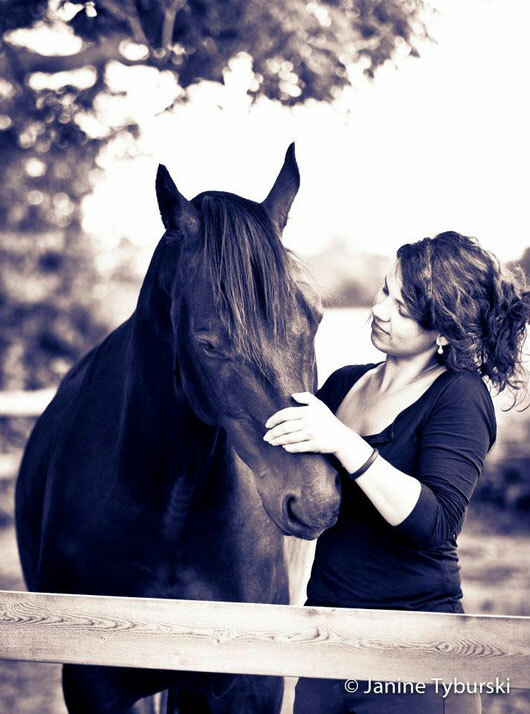 Hanna Engström, who is unbeatable in making people feel and realize their own body, emotions and their horse. I feel very lucky and honoured that for three fantastic years, I was allowed to work and live as an instructor and manager @Ekeskogs Riding Academy. To build up a Riding Academy and to develop education plans for further education of instructors and students within the Academic Art o Riding was a dream coming true. Leaving Ekeskogs now to build up my own farm in Germany is truly one of the hardest decisions I had to take in my life until now. Leaving all the entrusted and dearly loved horses behind, the magical island of Gotland with its rough and still so beautiful landscape and the home and second family I found there. I was allowed to grow there, as a rider, instructor and as a person. This place and all its inhabitants will always have a special place in my heart. Considering that the journey is the reward, I am looking forward to the exiting upcoming years of founding a place with as much energy, knowledge and love for horses in Germany, too. So, you are welcome to Germany and tell me about your journey into the Art of Riding.